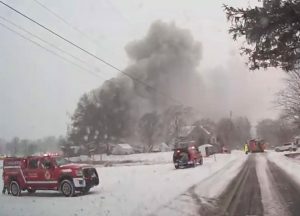 On February 21st, 2019 Crews were dispatched to a barn fire on Bauman Road in the township yesterday afternoon at 1pm during the snowstorm. While enroute Chief 57 was advised that the caller now reported heavy black smoke coming from the building. 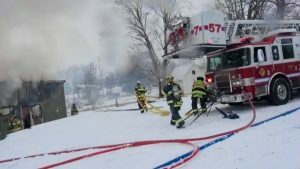 Deputy57 arrived to find fire showing from the barn. Chief 57 assumed command and requested a tanker task force due to no hydrants in the area. TW57 arrived on scene and dropped LDH in driveway than placed a 2-1/2″ line, and 1-3/4″ line in service for an interior attack. A water supply was established with a tanker site at the intersection on Bauman Rd. 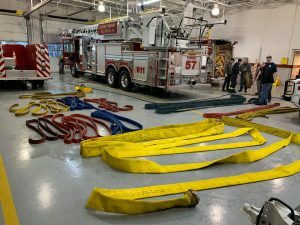 Crews used additional handlines to extinguish the fire and a long overhaul started. The barn was filled half with farming equipment and half with hay. 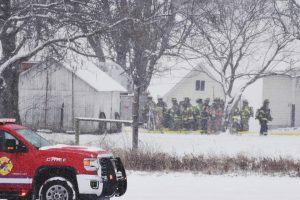 Crews used heavy equipment to remove the hay from the barn and extinguished all visible fire. 2 firefighters were transported to the hospital to be checked for minor injuries. Special thanks to all of the mutual aid companies that assisted us today (don’t remember all that were there) as well as North Penn Goodwill And Dunkin Donuts for providing food, drinks and shelter. 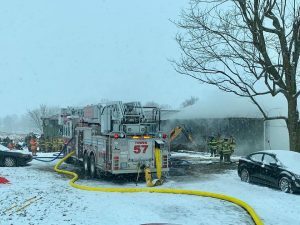 Also Sellersville Fire Company and Tylersport Fire company for covering the area while we remained on scene. Companies were back in service ‪around 6pm‬.